The summer solstice – along with Beltane and Samhain – are traditional times to honor the fae, fae folk, faeries, or simply, fey. They are magical creatures with powers given them by nature. They are guardians of botanicals, water sources and other natural elements. Others live in a magical underground kingdom. Fey exist in all cultures, from the little people to elves, and from gnomes to leprechauns. They appear in art, music, folklore and movies. Fey have magic, and magic in and of itself is not good or bad, it’s all about how it’s used. For some reason, many Americans think of faeries only as cute, tiny, harmless winged creatures. While there are some who look like that, there are many who are ugly and fierce. They can be playful and mischievous or annoying and frightening. If you’ve ever left a pair of earbuds out, the fae will be attracted to come and tangle them. Keys left out can also prompt fey pranks. The fae like sugar, milk, honey, flowers and miniature people things like fairy houses. Tess Ahlberg makes houses for them from bark, mushrooms and other gifts of nature. From a young age, she said she was immersed in nature. She’d collect moss, pine cones, mushrooms, animal skins, shells, feathers and discarded insects during her travels in woods, meadows, marshes, swamps and on beaches. Listening to the messages whispered in the leaves, she was inspired to begin making faerie houses out of birch bark she found decomposing on the ground. “I ask permission from the forest, if I can harvest the bark, mushrooms, plants and moss. 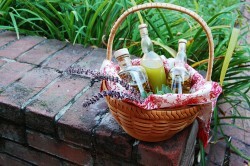 I also give the spirits a token offering,” she explained. Milkweed pods and acorns, along with ferns, leaves and wild flowers that she’s pressed also found their way onto pieces of birch bark. She continued making houses, painting cured mushrooms for roofs and adding some details. They add whimsy and magic when placed in a home; if left outside they will slowly decompose. To encourage others to appreciate nature, provide homes for the fay, and an escape from the chaotic world, Ahlberg makes kits available. But you can gather all the materials yourself and make a home to invite the fae to visit. “In today’s society there is a disconnect with nature,” she said, hoping to help change that by reconnecting people with it. “Faeries are inter dimensional beings. If you go back to remembering your innocence of youth, a time when perhaps as a youth, some of us had glimpses into other enchanted worlds. We saw faeries and other enchanted beings in our peripheral vision,” she said. You can connect to that magical world by being fae friendly. Houses and other inviting spots can be portals into enchanted worlds. Try building a cave out of pebbles in a hidden spot in your yard, such as under bushes or in a flower garden. Set out a miniature wooden table and chairs, painted bright colors or wrapped in vines if you wish. Making a circle of stones, shells or pinecones can create a magical space. Hang tiny bells from branches. Flowers such as daisies, cosmos, tulips, honeysuckle, lilac, sunflowers, lavender, snapdragons, pansies and heliotrope are all said to attract fey, as are herbs such as rosemary, mint and thyme. My three favorite spots in the yard where I was grew up were a stand of lilacs with a narrow space in the center, the small space between two large oak trees, and a willow tree I loved to climb. To feel close to the fae now, I plant cosmos, sunflowers, rosemary and snapdragons in my community garden plot, leaving the center wild and untouched, seeded with wildflowers that attract hummingbirds, a mugwort plant and morning glories that reseed themselves. I leave offerings there from time to time, and know the fae are present because if I make the mistake of brining my cellphone, they download apps while I work in the garden. They also bless me with joy. May they do the same for you. Check out Tessimals Celestial Faerie Houses and Faeries on Facebook or at https://www.etsy.com/shop/tessimal. This is a bittersweet time in the herb garden as the days grow shorter and temperatures are beginning to cool. The plants which have been attentively nurtured since early spring are now sporting an overgrown and somewhat rangy appearance. 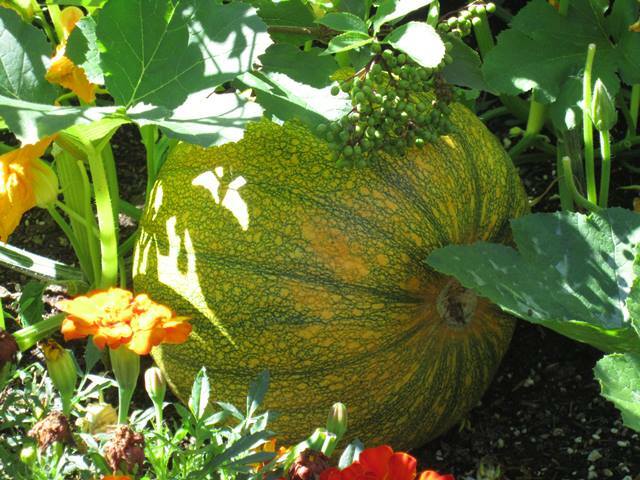 Many are yellowing, setting seed, and turning their growth inward to their roots to prepare for the winter respite. This has been a very prolific gardening season for me, re-introducing my herbal plant friends back into their newly expanded garden bed. 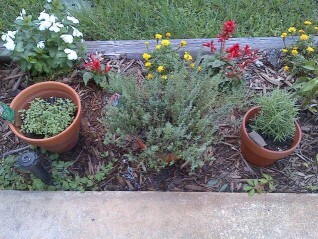 Two years ago, my husband surprised me with his plan to double the size of my herb garden. Although his intentions were wonderful, we did not anticipate the length of time it would ultimately take to complete the project. It seemed either he had little time due to his work schedule or, when he did have an expanse of time to work on the garden, our wonderful wet Pacific Northwest weather didn’t exactly cooperate. Removing sod and moving vast amounts of dirt is nearly impossible in the rain. I have to admit I was growing impatient. My herb plants had all been removed from the garden the previous year into containers and our backyard was beginning to look like a garden nursery. Most herbs have a wild heart and rebel when placed into pots. St. John’s Wort, which I rescued from an area in our neighborhood slated for bulldozing, was languishing in her pot sporting only two long, spindly stems. Calendula grew leaves, but never blossomed. The tiny Oregon Grape plant, also a ‘rescue’ was down to one green and somewhat shriveled leaf. There were numerous casualties, as well. Early spring brought a two week period of perfect weather giving my husband enough time to finish the brick wall surrounding the new raised bed. After a truckload of garden soil was delivered, the big day finally arrived to replant my herb friends into their new home. Fortunately, I was wise enough to use the down time between the previous summer and winter months to make an inventory of my plants including details of their growing needs, so when the time came to replant, I had a pretty good idea where everyone should go. As I was finishing up the replanting, I had several small pots with unidentified plants (I am not always consistent with labeling my pots-a bad practice). As I was placing the unknown entities into the compost, there was one that at the very last moment caused me to stop. 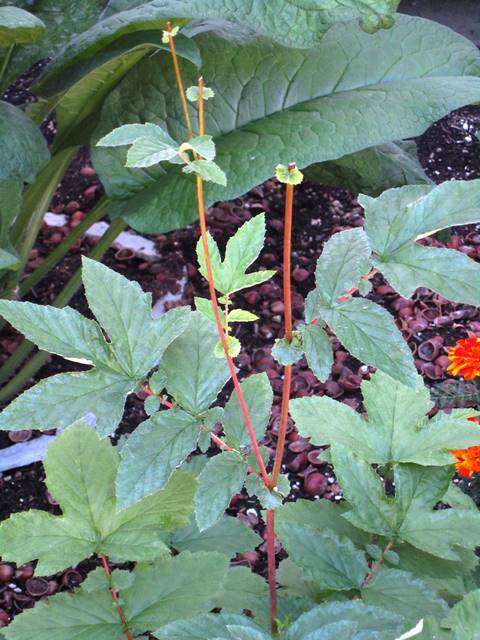 Hmmm…this did not look like a weed; its leaf pattern and stem color were too unusual. Then I remembered that over a year ago, I planted some Meadowsweet seed in a little pot, but the only thing that grew was Chickweed, so I put the pot aside. Over one year later, here was a little Meadowsweet plant making her entry into the world. Excitedly, I planted her in the new garden, thinking she probably would not get very large until next year. WRONG! She grew quickly into a very lovely plant, living up to her other name, Queen of the Meadow. I remembered reading that some seeds can take up to several years before they will germinate- another lesson in patience this year. I planted the tiny Oregon Grape into the new garden, but she looked like she was barely hanging on. Part of me considered putting her out of her misery and adding her to the compost, but I decided to leave her alone. A week later, her one remaining leaf dropped and she looked like a bare twig…still, I left her be. I was happily surprised when after several weeks, six new leaves appeared. And so it continued throughout the summer. 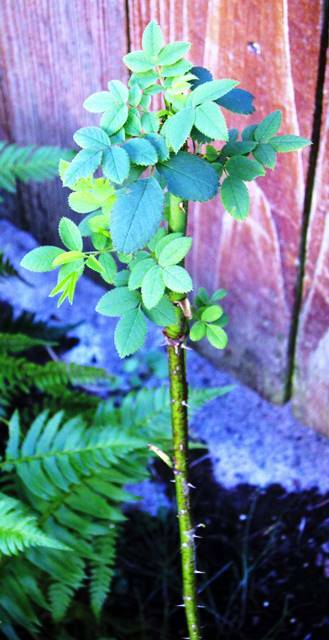 Two small wild rose plants and a tiny English Hawthorne, also rescued from an area near my home slated for ‘development’, took root, growing small but lush green leaves with time and nurturing. Ah, but there was another lesson to be taught by this lovely new garden-the lesson of boundaries. When I replanted Comfrey, I carefully placed a collar around the plant setting it down deep into the soil to help contain her wonton growth. Her unabashed expansion in the past infringed on many of the other garden residents and I knew that if she was to co-exist with other plants, her growth needed to be contained. However, several weeks after the thick layer of new garden soil had been added, down on the other side of the garden where Comfrey used to grow were multiple baby Comfrey plants making their way upward through the many inches of soil. Although I tried to diligently remove the newcomers, one baby plant managed to escape my attention growing quite tall. So much for containment devices! And then, there is the saga of our pumpkin plant. As the new garden bed is quite large, I decided to add some vegetable plants in between the herbs. 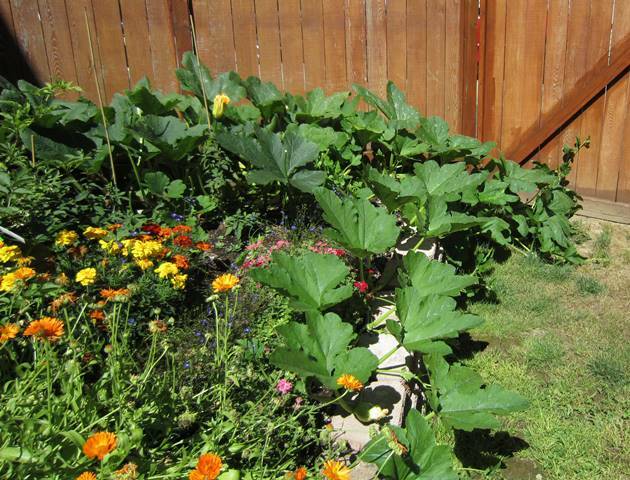 I have fond memories of growing pumpkins in my front yard when I lived in eastern Washington, and decided that a pumpkin plant would be a fun addition to the new garden. We bought two tiny pumpkin plants- two different varieties. The smaller plant never really seemed to do well-it stayed small and its leaves were an off-yellow color. However, after several weeks, the larger plant developed an incredible growth spurt and has not showed signs of slowing down. Every other evening I trim off several inches of new growth from the ends of the vine, removing multiple leaves which encroach on the herb plants territory. However, this only encourages the pumpkin plant to sprout new off-shoots. Although we have several nice sized pumpkins beginning to turn a lovely orange hue, the vine shows no sign of slowing her march across the garden. The last time I looked, she was headed out of the garden, onto the lawn and attempting to scale the fence. Her leaves are so large and tightly clustered that I am afraid I may one day find an unsuspecting neighborhood cat snared in her vine. We have named her Audrey III, after the plant in Little Shop of Horrors and I swear that several nights ago, I heard her say in a quiet, deep voice, “Feed Me.” I was considering cutting most of the vine back, however, the new blossoms are attracting bees, and as their populations are so fragile right now, anything I can do to help them survive is important. So, for now, I just gently prune Audrey III several times a week to prevent her from completely taking over the garden. As the wheel of the year turns toward Mabon and my lovely garden prepares for its winter rest, I am thankful for the lessons she has taught this summer- patience and boundaries. She has reminded me that all things have their own tempo for reaching their destinations- we only need to provide the essentials and have patience not to otherwise interfere. I have also been reminded by a small, exuberant pumpkin plant that although we humans think we exert control over our environment, it is Nature who establishes the boundaries, and we really do not have as much influence over Nature as we would like to think. This Sabbat heralds in Spring and we can shake off that cabin fever everyone’s been suffering from. This month’s column will focus on early spring herbs. Lavender Leaves: Is a wonderful remedy for breast inflammation, mastitis, cancer and cysts. Step 1: Gather approximately 2 cups violet leaves and flowers and plantain leaves (either the narrow or wide leafed varieties). Step 2: Try to clean off the leaves as much as possible without washing them. If they must be washed, do so, but be sure that the leaves are thoroughly wilted and absent of all moisture before adding the oil. Putting the oven on the lowest possible heat, arrange the herbs on a tray, preferably with the oven door open, and allow the leaves to wilt until you are sure no moisture remains. You are not diminishing the healing power of the herbs but rather, just removing more of the water content. Step 3: Put the wilted leaves into a clean, very dry glass mason jar, or similar container, and fill to the top if possible. Then add the oil of choice (olive, grape seed, sweet almond, sunflower and safflower all work well) until you have filled the jar. Stir with a long spoon or chopstick until all bubbles have risen to the surface. Add a bit of Rosemary Oil Extract to prevent oil rancidity and further protect the oils. Just remember that water causes mold, so the drier your herbs and containers are, the more protected your oil is. Place some wax paper over the top of the container and then cap with a canning lid. Be aware that the oils may ‘weep’ while it steeps, so you may want to put a cup saucer under the jar. Step 4: Place jar in a cool, dark place. Occasionally turn the jar upside down and then right side up to move the oil through the herbs and to try to keep all parts of the herbs covered with oil. Feel free to open it up and check on the herbs. If you see leaves poking through where there is some mold growth, remove the leaves and discard. If mold grows throughout the oil, you’ll have to toss the whole batch, as there is no saving the oil, even if it is heated. Steep 2-6 weeks. Step 5: After 2-6 weeks, strain out the herbs using a cheesecloth and pour the infused oil into a clean, dry jar for storage. A dark glass container is best. You can keep this in the refrigerator for better storage or just store in a cool, dark place. In a double boiler or a saucepan on lowest possible heat, melt the beeswax into the oil. Add the additional vitamin E and rosemary oil extract, if using, and gently stir the oil with a wooden or stainless steel spoon. Remove from heat and add the essential oils. Pour immediately into a cleaned, very dry glass or aluminum container. You can also put this salve in lip balm pots to create a healing travel balm. If looking for a hard salve, test the consistency by putting a spoonful of the melted oils & beeswax into the freezer. If it is not hard enough, add a bit more beeswax until you reach the desired consistency. Lemon Balm: Lemon Balm is part of the mint family. This herb can take the crazy days of early spring weather. Plant this one into a container then plunge into the ground or it will escape and grow everywhere. You can generally get two harvests during the year. Dill: This herb grows lightning fast in cool spring soil. Dill will reseed itself once you trim it back. Plant now and at weekly intervals so you’ll have it throughout the season. Cilantro: I grow quite a bit of cilantro. Grow early you can get a couple harvests from this plant. Be sure to sow directly into the ground. It can tolerate even a light coating of snow. Basil: It may surprise you that basil does really well if started as seeds indoors (right about now) and then transplanted outside when the threat of frost has passed. It also grows well indoors. 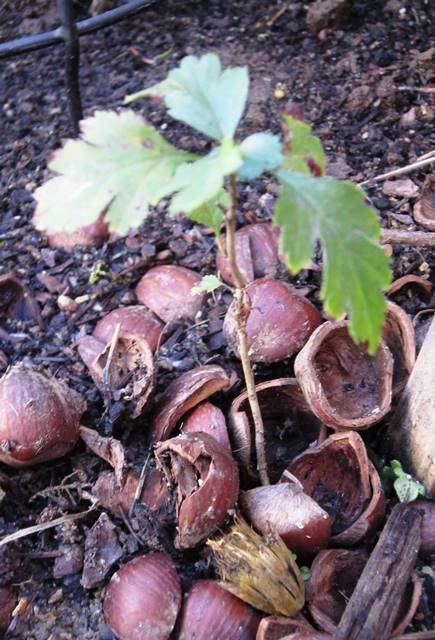 Start seeds inside and keep them in a sunny until they become large enough to transplant outdoors..
At this time of year with Earth Day having just passed, and Beltane being here our thoughts turn to our gardens and the Earth Mother. In that spirit I would like to share this with all of you. The Great Sunflower project is an organization that I first heard about and began following 3 years ago. Due to the colony collapse of the honey bee, and the resulting damage to crops from the loss of pollinators, this is a project that’s not only fun it serves an awesome purpose. For 2011 they have started the “Add a yard to your yard” campaign. The way it works is you set aside a 36″x36″ section to make a pollinator garden. It has to be a sunny spot with a water source nearby. They state that you should use Lemon Queen sunflowers and the other plants they recommend by name are California Poppies, Tropical Sunset Echinacea, Bee Balm, Cosmos, Cornflowers, and White Borage. They also used carrots and radishes that they let go to seed. Group similar plants together because pollinators are attracted to clusters. In my past attempts to attract pollinators I have found that the boxes of wildflower mix that you pick up for a couple of bucks work really well, especially hummingbird and butterfly blends. Butterflies will congregate around pie pans , or other shallow containers, with sand and a little water in the bottom to drink from. I have also had great results with petunia’s and morning glories. This is a project that can’t go wrong. The end result is beautification and a closer relationship with the earth and thats never a bad thing. For more info check out their web site greatsunflower.org, they have links to sites for seeds, native pollinators, etc. I have been a big fan of these guys for a while now and I hope that now they will pick up a few more!! Have a blessed Beltane!!!! !